One aesthetic in contemporary art is to to reduce form, dimension and line to its minimal essence. 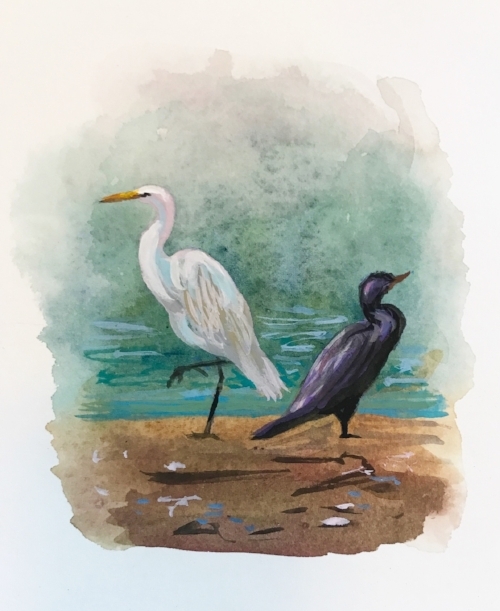 Many artists set out to convey their thoughts and inspirations in as few strokes as possible, something like a visual haiku. The River's Journey Project is our artistic exploration of our water source. If I were to reduce Rose Compass's quest to it's most minimal form, I would say "water = life". Water is our most basic resource for survival. Without it, life doesn't exist. Even in our grandest space explorations, we use it to find new life. It makes sense that NASA uses a "follow the water" strategy to locate other life in the universe, says astrobiologist, Lynn Rothschild. It seems our search for water is wired into our DNA. During a 2010 TED talk, Denis Dutton proposed "A Darwinian Theory of Beauty". When people were asked to describe a beautiful landscape, they universally identified these elements- ". open spaces, covered with low grass, interspersed with trees. And if you add water to the scene—either directly in view, or as a distant bluish cast that the eye takes as an indication of water—the desirability of that landscape skyrockets". He theorized these were the elements necessary for human survival: grasses and trees for food (and to attract edible animal life); the ability to see approaching danger (human or animal) before it arrives; trees to climb if you need to escape predators; and the presence of an accessible source of water nearby. Considering our brains are 80% water and our bodies are 60% water, we are deeply connected to this resource. I love this description by science writer Loren Eisely. "Human beings are a way that water has of going about, beyond the reach of the river." Follow the journey at www.rose-compass.com. Here is a recent blog post from that site with some extra pictures. I am wishing all of you the best for the upcoming Thanksgiving Day Feast. Thanksgiving is next week and it still feels like summer. Over the course of the Rivers Journey project (see Rose-Compass.com) , we have travelled to a number of sights along the watershed. One of the joys of being outside is there are always birds as companions. We were informed that they would stop releasing water into the Santa Ynez river in the next day or so(this was at the end of August). So, we made another road trip to see the river with some water still flowing. The roads that meander through the valley are as beautiful as the river. The California Magpie greeted us. I think they are a cheerful bird and always stand out with the high contrast of black and white with the yellow beak. On our way home, we saw a flock of turkeys. And they are really a flock, because they are wild. Although these turkeys are not native, they are wild. A group of domesticated turkeys is known as a rafter or gang. Those are the ones most of us will have at the table on Thanksgiving Day….one of the gang. I hope your holiday will be filled with friends, family and a grateful heart. As timed transitioned from summer to fall, our explorations led us down Paradise road, past the burned area were the helicopters from Cachuma had dropped their buckets of water to drown the Rey Fire. As we drove further down the road we crossed passages that are often covered by water when the river is full. The day was full of fall colors. We do have autumn splendor in Santa Barbara, you just need to know where you can find it. 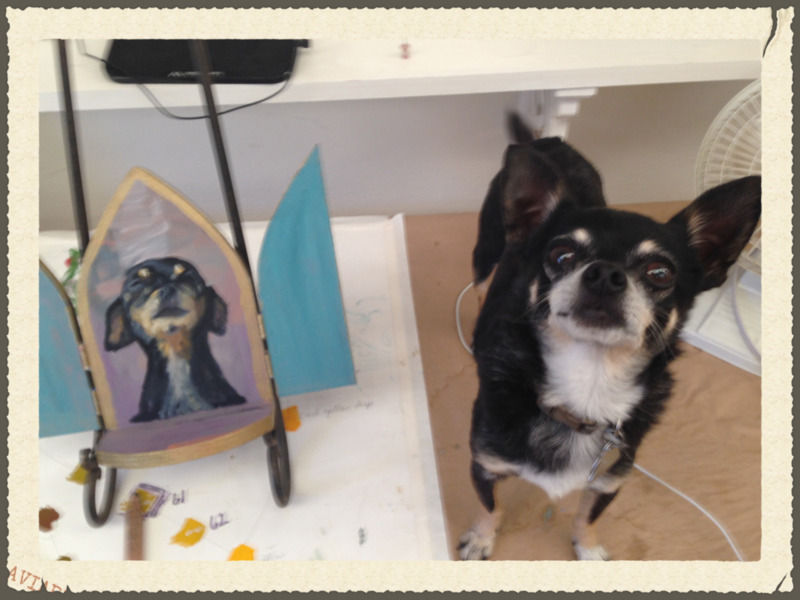 If you have been to my studio, you've probably met my sweet adorable Chihuahua named Bruiser. His nick name is Lucifer. That should give you a hint about his lovable nature. I thought I would capture Bruiser's personality in 360 degrees on a little ritablo. Bruiser posing for his angelic side. I finally got to see one of my favorite artists at the San Diego Museum of Art. I own several of his art books, but I finally got to see his work in person. They were so big! and so small! I loved his collection of "apuntes" (translates to notes from Spanish). These small sketches are lovely, intimate, little vignettes. And that is exactly how I like to work! Often, my little apuntes, are really just dots of color. Some may end up as a new large painting. I wait to see which images sing the loudest. I wait to see which images sing the loudest from my new little flock of miniature masterpieces. Here is my latest batch of "apuntes". You will get to see these in the "Six Pack Exhibit" at the Santa Barbara Tennis Club. Some of these are ideas for my Go For It series. Of course, my Water series are always entwined with summer and fun . And now, I'm Playing with Fire (new series). Here is an example of a small sketch that got upscaled into a large painting.